Let's control KeiganMotor by Windows PC using open source software "Tera Term". Please update KeiganMotor firmware to the latest. You can download Tera Term from the following site. At first, you config serial port settings with Tera Term. Please select the USB port connecting to KeiganMotor, and set baudrate to 115200 and set flow control to "hardware". 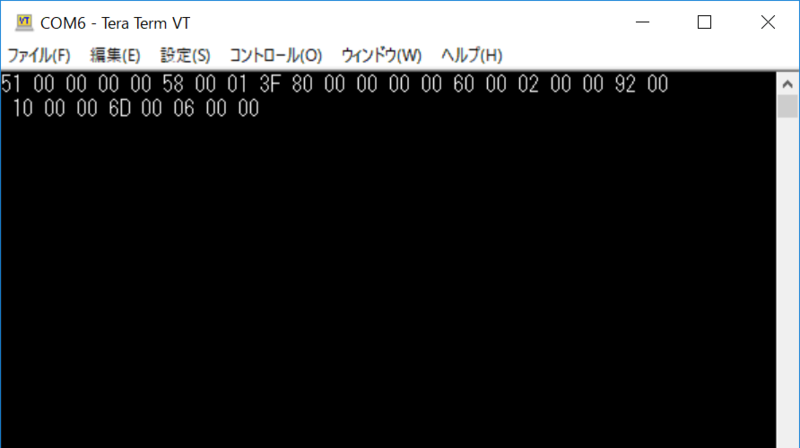 If you choose Japanese language, [漢字-送信] setting must be [SJIS], or bytes data cannot be sent correctly. When sending bytes with Tera Term, it is hard by manual input. Here we use macro function of Tera Term. You can read and execute any macro from menus [Control] > [Macro]. Please download the following sample and make sure that KeiganMotor moves. Set the speed to 1 radian/second, then run forward for 10 seconds, and run reverse for 10 seconds and stop. The contents of macro is as follows. ; Set the speed to 1 radian/second, then run forward for 10 seconds, and run reverse for 10 seconds and stop. KeiganMotor echos received bytes array. This function may be deprecated and change to more readable logging function in the future . Tera Term can display hexadecimal after the following configuration. You edit TERATERM.INI in the Tera Term installed directory. In most cases, it will be in C:\Program Files (x86)\teraterm. ; Debug mode type which can be selected by user. Next, you restart Tera Term and press Shift key and Escape key at the same time and turn on hexadecimal display. By this configuration, you can see hexadecimal returned by KeiganMotor on Tera Term. When you execute the above macro demo_1, the log will be as follows.